As described on our website and shown here in the earlier post, this years' Christmas booklets have both Madonna and Competition stamps in. I hadn't realised (because I didn't read the advance information thoroughly!) the counter sheets also contain both designs. The 2nd class, 1st class, and both Large Letter sheets all contain both designs in one sheet. Unlike definitive sheets of 50 (which are smaller stamps), there is no central gutter - which means that there is one novelty aspect which collectors might have bought but Royal Mail didn't think of. The first image shows a photo of several sheets (Large Letter and two airmail). The other two are from the Post Office website and don't show the sheet margins. I've only shown the 1st class sheet and the 2nd class Large sheets; the 1st Large and 2nd are similar. From the first picture you can see that the printing date and sheet number are in the upper portion of the sheet, and the traffic lights and FSC logo are at the bottom. 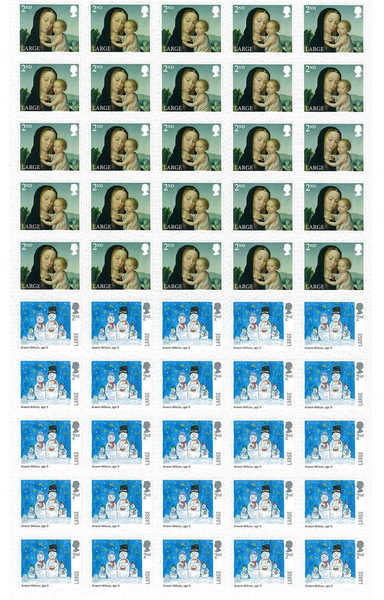 The cylinder numbers are at the lower left, so there is no cylinder block for the Madonna & Child stamps (and no date block for the competition stamps). I believe this is the first time that this country has ever had two stamps of different designs in the same sheet, other than in se-tenant pairs/strips. If anybody does want se-tenant pairs or strips of 10, then I can order them. 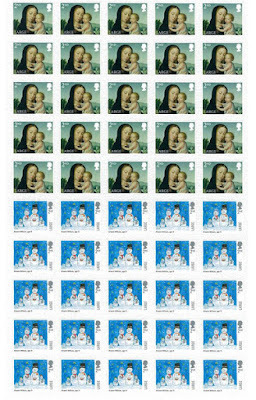 Printing of the Christmas stamps usually starts in high summer. What is interesting from these pictures is that the 1st class sheets available locally were printed in July while the 2nd class were printed in September. There will be many other dates: I don't aim to record them all, but will list in this post, any more that people provide. For the record, here are pictures of horizontal pairs from the centre of counter sheets - what would have been gutter pairs had there been a gutter! Although delivered to many post office branches unfolded, these are often soon folded and thus less desirable. This format is not available from Royal Mail at this time. I see the RM have sneakily increased our spending on Booklets by printing two versions of each retail booklet of 12 stamps. This will be the norm for the future. Good sales ploy. 1. you don't have to buy everything. 2. my view on the extra booklets has already been discussed with the original announcement rather than this post. I think these will be the religious alternatives for 2018. 3. It can only be the norm for the future if there are two types of stamps. I don't see competitions occurring every year. For the last competition the booklets of competition stamps contained 20 of each, so this is actually a cost reduction! glyjo, RM didn't issue extra booklets to fleece collectors - they are an ongoing stock requirement for retail outlets. It is short sighted to always assume that these products are there only for collectors. Despite the fact that Christianity is now a minority religion in this country (most of us aren't religious, let alone other religions - RM still persist in producing ugly religious products every other year when they are only required by a minority who could buy them in special booklets online or perhaps in their local place of worship. There isn't a problem, in my view. Aside from collectors who think they have to buy everything that Royal Mail produces - I don't, why should you? - people who like Christmas stamps are entitled to assume that the postal authority will produce them. And people who want other stamps should find that there are sufficient alternative 1st class and 2nd class stamps for their mail.